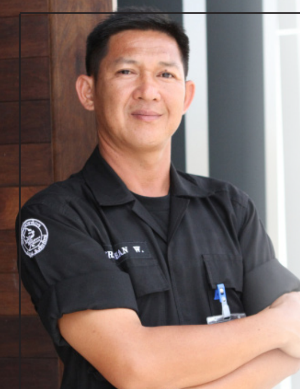 As a guard for eleven+ years at Grace International School, Dtui has had contact with many believers. Several of the teachers and parents within the GIS community have taken the time to get to know him and have invited him to church. He was never interested until a need arose in his life. Over many years, Dtui and his wife incurred significant debt, which was growing larger by the month. Out of desperation, Dtui and his wife, Daa, accepted an offer to receive financial counseling from a GIS staff member and local church planter whose children attend Grace. While the counseling was based on biblical principles, the counselors made it clear there were “no strings attached.” They offered their services out of love for the Lord and for Dtui and Daa. The concept was puzzling to the couple. In Thai culture, there is an expectation that one owes another person when they receive a gift or an act of kindness. There were other things that mystified Dtui and Daa. Where did the joy come from which Daa observed in the two GIS families she worked for as housekeeper? Why did the Christians at GIS respond with respect and love when the unfair lawsuit was brought against the school? These things intrigued them enough to finally accept an invitation to church. They began to learn that they owed more than just a monetary debt, but more importantly a debt of sin that was enormous but was already wiped clean by the death and resurrection of Jesus. Dtui was baptized and made the decision to follow the God who chose to love us “with no strings attached”. Thanks for partnering with us + Grace International School to be a part of these stories and make God known in Thailand.